This page is for those who work with and for young adults through ministerial outreach and programming. What are young adults Seeking? Link to " Sons & Daughters of the Light"
the relationship between man and woman, and the social doctrine of the Church. Have one person, either staff or volunteer, who is ultimately responsible to see things through. 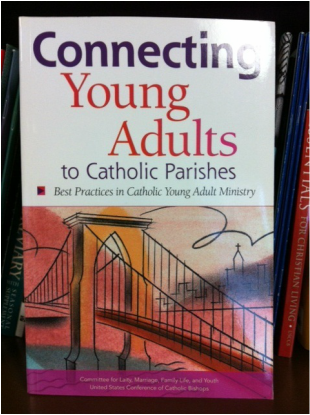 Don’t forget to include things that already take place in the parish that can be easily adjusted to be young adult friendly. Every once in awhile ask — Where would you like the young adult ministry to be next year at this time? Three years from now? Five years from now? Gather your Young Adult Ministry Core Team. Schedule some time to pray together and get to know one another. Go through the assessment process outlined in Essential: Assessing the Situation if you’ve not done so already. Complete the “What are the interests and needs of our young adults?” discussion that’s part of the assessment process. Look at your SWOT Results and your list of interests and needs, and choose three priorities (by discussion, vote, or consensus — just know ahead of time which method you’d like to use) to work on in the year ahead. Allow the group to choose at least one long-term priority — something important but that you don’t currently have the time or resources to address but can move toward in the future. Using the list of topics that are interesting and/or important to young adults, create a list of potential events. Create a calendar and fill in the various types of events: Teach, Pray, Serve. Use Young Adult Ministry in a Box Step-by-Step Programs to get some ideas. Ensure that you have a good mix of events. Use the planner’s template to help you prepare for everything you need to do for unique events that you create. Create a marketing plan both for your overall ministry and for specific events. > Advocating for the vision of Sons and Daughters of the Light with diocesan, parish, and campus leadership and for “young adult friendly” policies, procedures, programs, and activities. ​> Networking with diocesan agencies, other religious denominations or congregations, and community organizations working with young adults. ​Also encouraing network at the deanery and regional levels so that parishes can support young adults while not haveing to try to meet every need individually - we can collaborate and cooperate! > Sending periodic email updates listing upcming events, opportunitis and resources directly to young adults you subscribe to the list. ​Founded in 1982, for decades, NCYAMA provided resources, training and networking opportunities for those serving in young adult ministries. Our mission is to help build up the Roman Catholic Church's ministry to young adults in their late teens, 20s and 30s across America. NCYAMA works with local dioceses, parishes, campuses, and groups to achieve this goal by equipping them with the best resources in the field, offering training, consulting, and workshops on young adult ministry and evangelization, and networking with and advocating for Catholic leaders working with young adults from coast to coast. The National Catholic Young Adult Ministry Association (NCYAMA) is an organization supporting those who minister to and with single and married people in their late teens, twenties, and thirties. We develop and promote programs and resources while providing opportunities for networking and communication. We advocate for the full integration of young adults in the life of the Catholic faith community in order to connect them with Jesus, the Church, the mission of the Church, and their peers. ​* The focus was on diocesan leaders, but then expanded to include parish, college and organizational leaders as well. > NCYAMA facilitated kindred groups at the Annual Membership Meetings for those serving in young adult ministry in 2002 in San Diego, 2003 in Salt Lake City. ​> NCYAMA facilitated Power Lunch/Roundtable discussions for those serving in young adult ministry at the NCCYM in Birmingham (2000), Denver (2002), and Pittsburgh (2004). ​as well as the 3rd Continental Congress on Vocation in Montreal (2002).